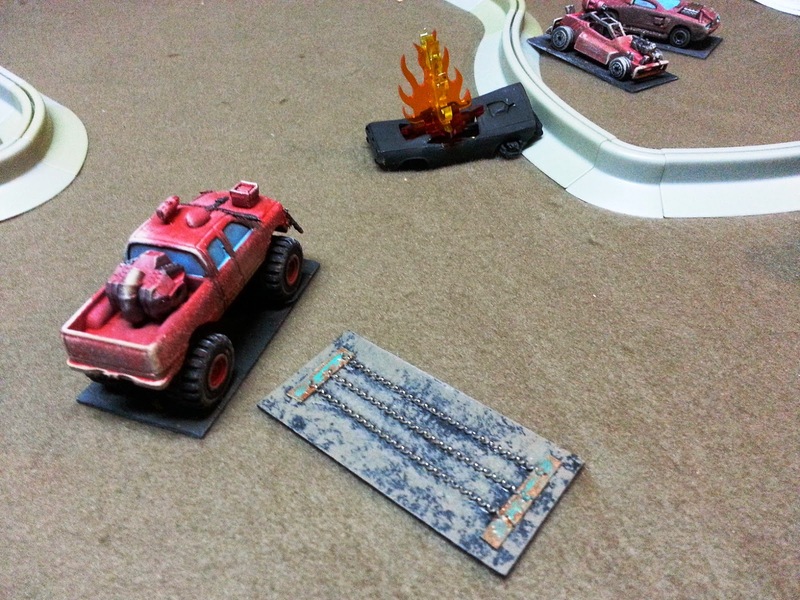 Conn-Man Games: Axles & Alloys Racing! Those words are never spoken in the Deadzone. 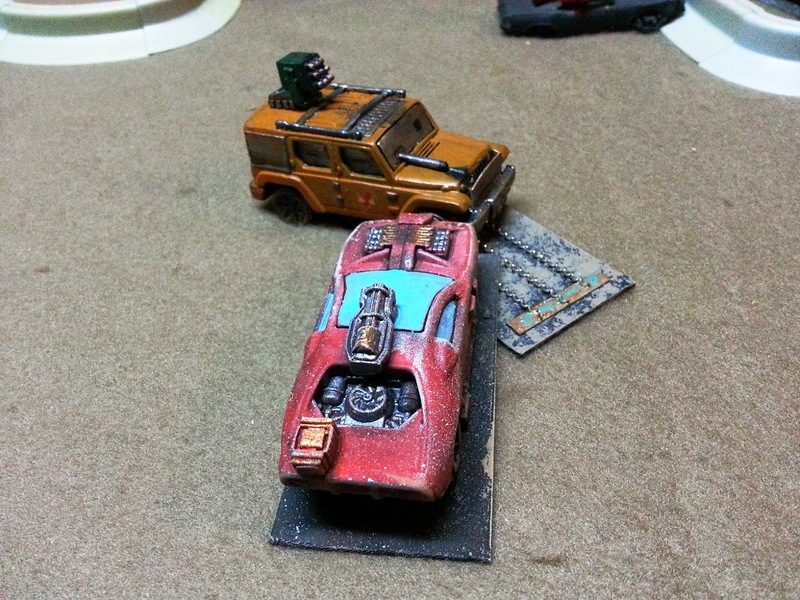 Instead, gangs put forth racers for the 'Deadzone Championship'. Little more than an excuse to blow the living hell out of rival gang members and then crow about it, the "DC" is held in a neutral location (at least for the duration of the race) and is the only thing the gangs consider sacrosanct. After discussion with a couple of group members, I decided to give this aspect of A&A a whirl. I had recently thrifted some ZipZap cars and track pieces (they look like Jersey barriers), which propelled this back-burner project to the fore. I decided to build a "figure 8" track, knowing full well that the middle was going to become a hotbed of contention. 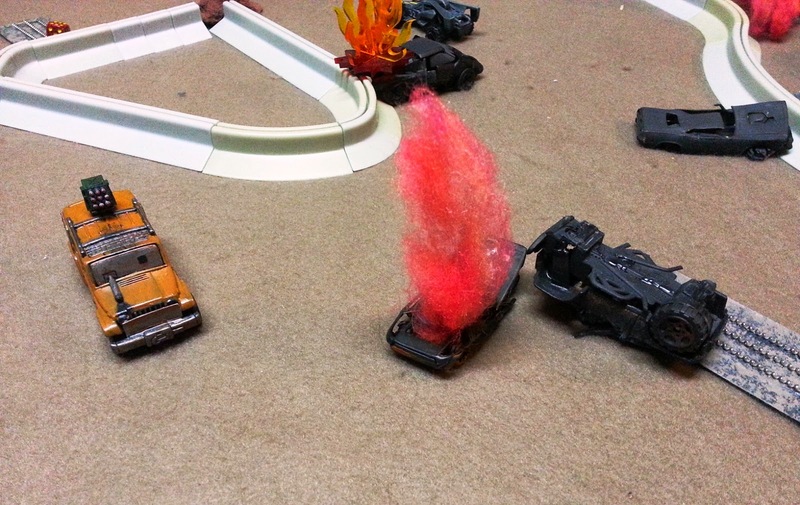 I also included napalm, smokescreens and speed reduction strips (SRS) as part of this track to make things more interesting. The race was played differently than in the A&A rules. 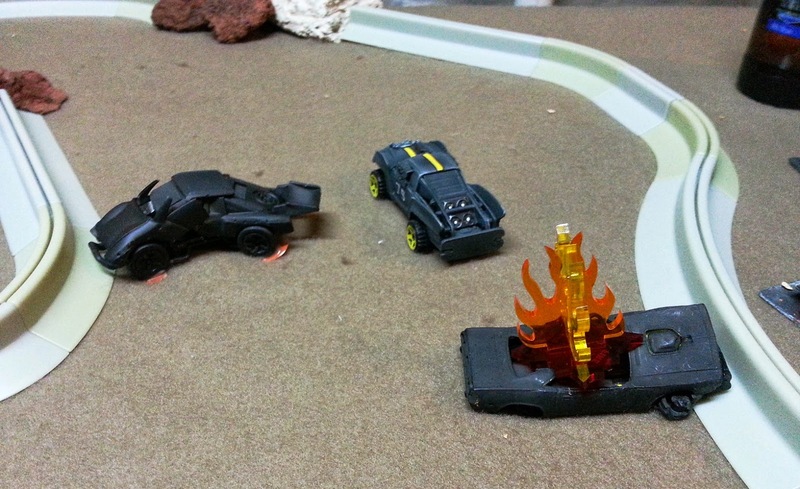 The players have three cars to use: one light, one medium and one heavy. 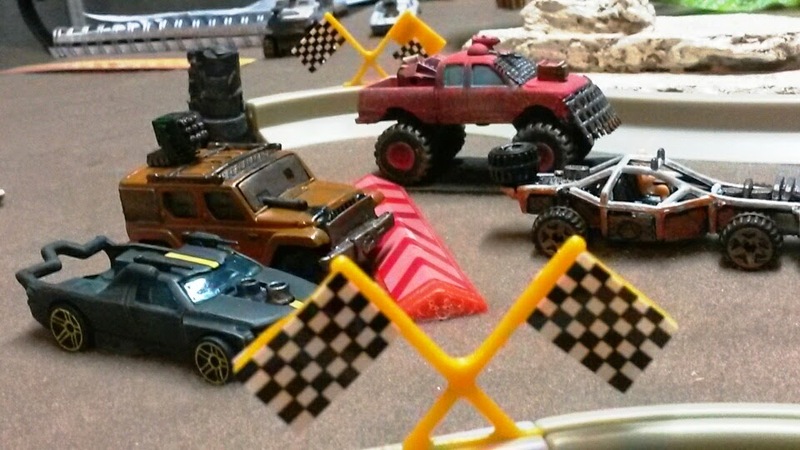 They can race them in any order they choose, but can have only one vehicle on the course at a time. Vehicles enter from the left-hand gap in the wall (as seen in the above photo) and have the choice of leaving the race through the right-hand gap or continuing on subsequent laps. If a vehicle leaves the race, it can't re-enter. 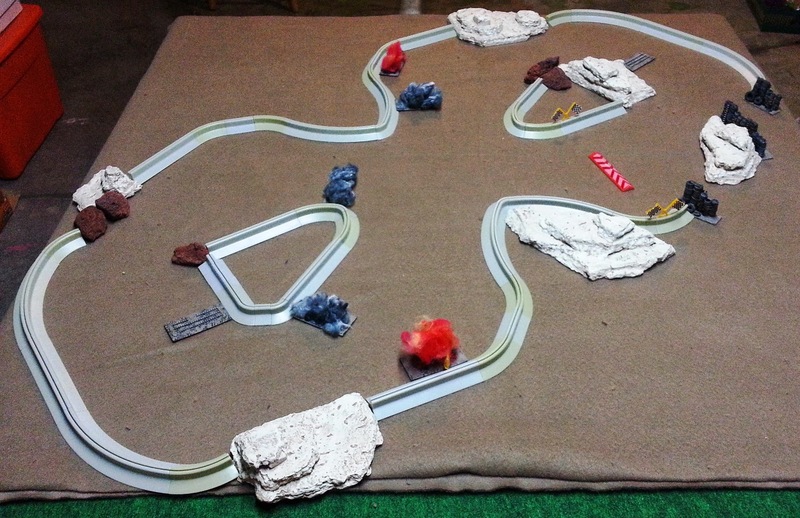 Another of the player's vehicles can only enter when the previous is off the track. Starting speed is between 0-6. Each lap completed equals one point. Five points wins the race. So, with jalapeno poppers, peanuts and adult beverages primed, we began. 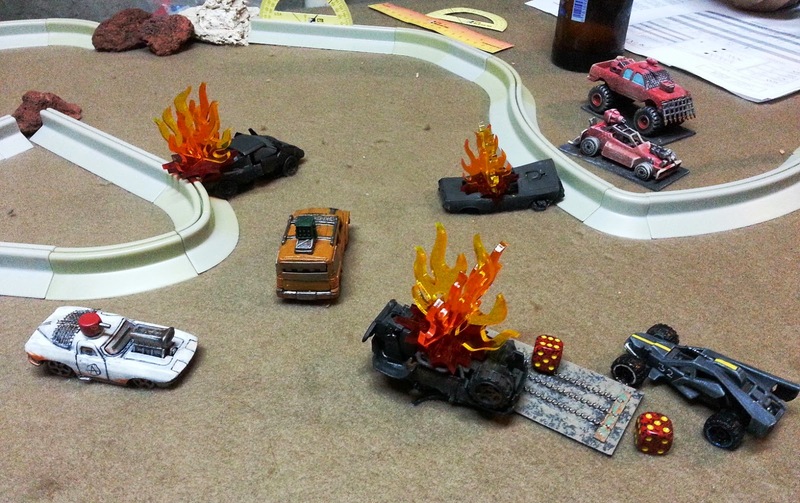 For our race, the action started hot and heavy. In the first round, the SRS in the middle of the intersection had everyone jockeying for position to hit the initial gap without being toasted by those around them. 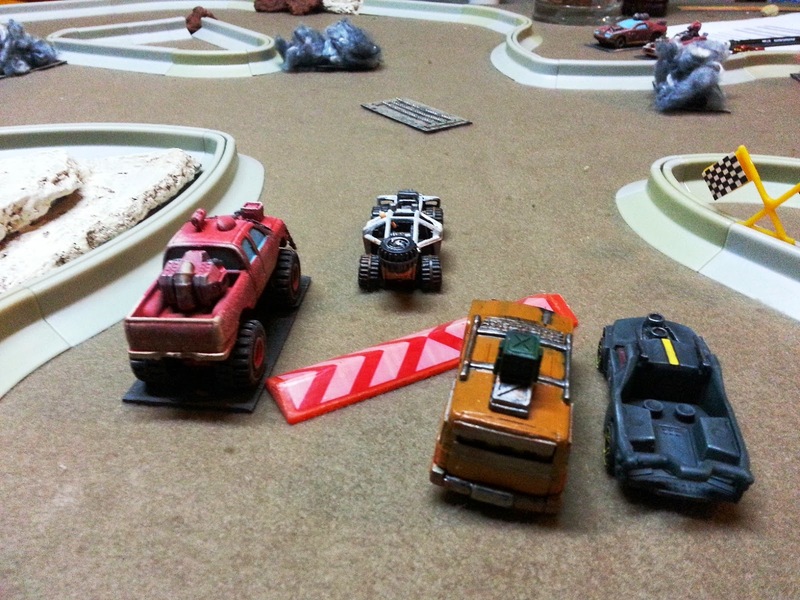 I had the only light vehicle on the track, so I shot out to the lead, clearing room and allowing the 'big boys' to tussle. 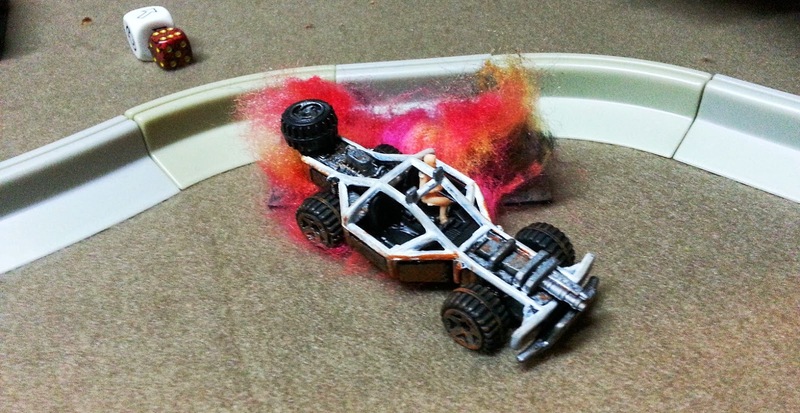 The first 'kill' of the day occurred when John Mark's vehicle collided with Ken's monster truck. You can see the results below. This was the beginning of a series of collisions in that general area of the track. This eventually created a 'choke point' that was difficult to navigate. 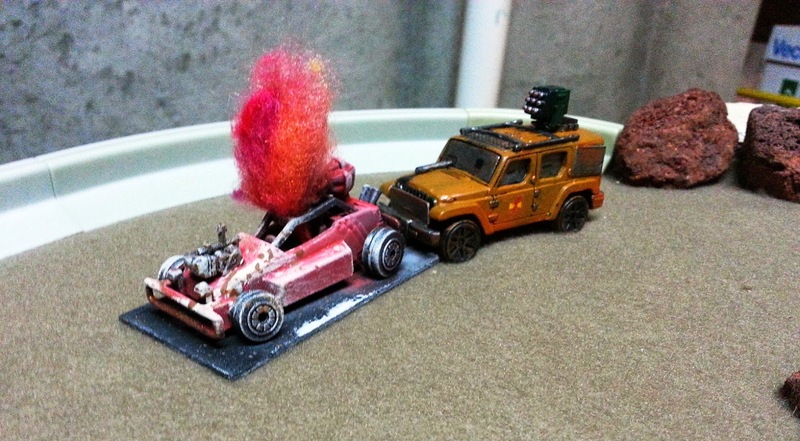 Rounding the bend, I lost control and drifted into a patch of napalm, catching my car on fire. My speed was high enough that I then rocketed straight into the side of a rock formation. 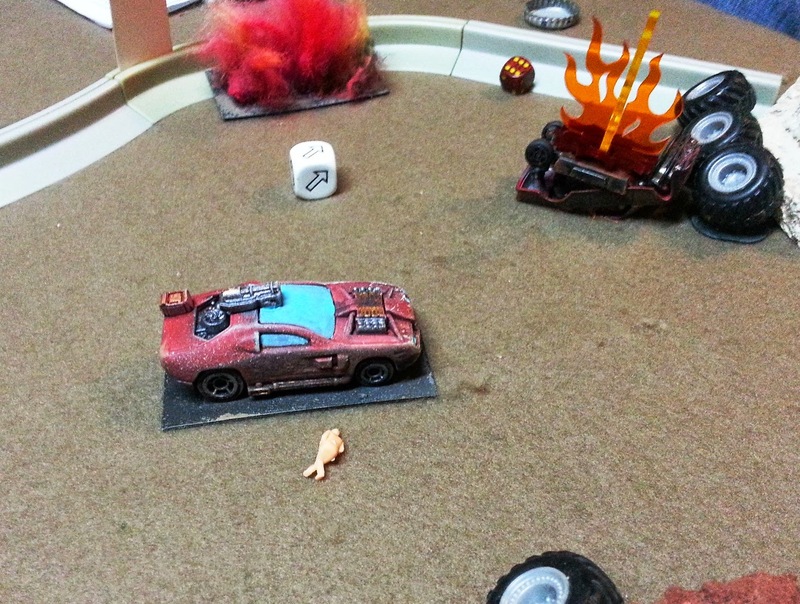 My driver, Pinkie, was ejected from the buggy and laid unconscious on the track. Prime pickings for Terry! Meanwhile, further back on the track, Kenny and John Mark were yet again making a scrum of it. This time, John Mark came out on top, sending Kenny's truck careening into a wall. He then zipped around the ever-more-dangerous first turn of the race in his "fishbat" car. 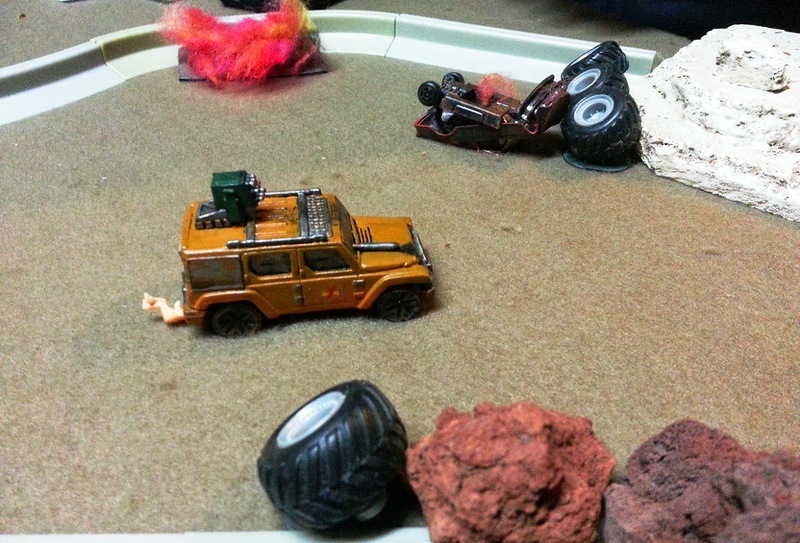 Terry's Jeep, 'the Dutch Oven', managed to complete a lap, earning him one point. It stayed on the track and was quickly given a "how you do" by my medium vehicle, 'the Fez'. Wounded, it continued on its inexorable way through lap two. Kenny's second vehicle managed to make it around the track once before meeting Terry in the middle. It didn't go well for Ken. It did manage to knock Terry around a bit, though. He had to do some deft driving to get back on the right course. 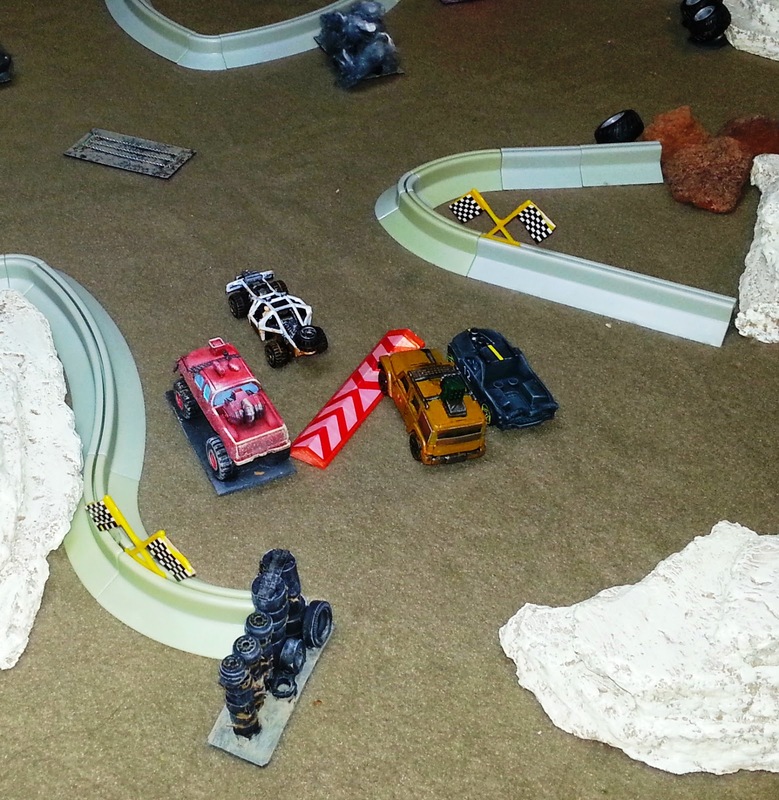 There was much jockeying, ramming and shooting in the second lap, with casualties piling up. 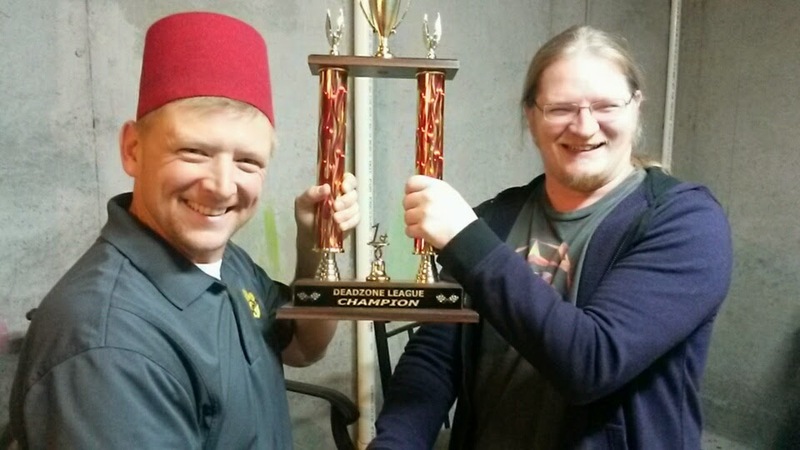 The Fez had no choice but to ram the back end of the Dutch Oven and was soon added to the list of casualties. Would anyone stop Terry? Ken did. In a stroke of brilliant driving, he power slid to right in front of Terry, forcing yet another ramming situation. The damage to Dutch Oven was too great and the Jeep finally gave out. 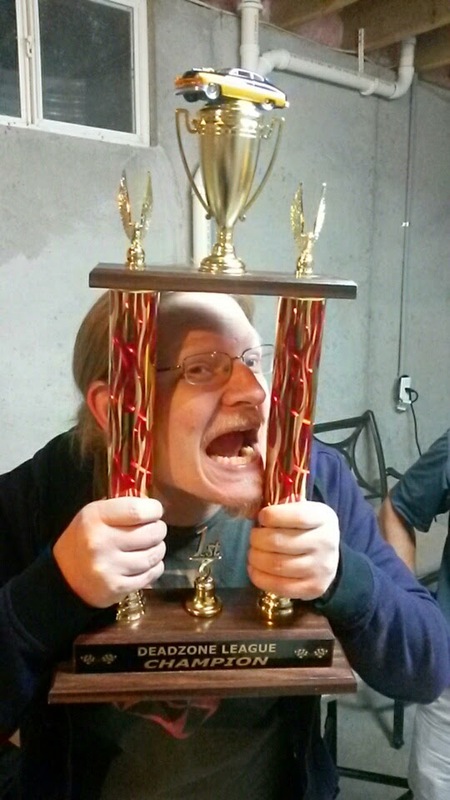 Terry took home the Deadzone League trophy (a surprise to the group, as I hadn't announced I'd made a trophy for this). Here's me presenting the trophy, fez intact (even if the car that I was wearing it for wasn't), and Terry enjoying the moment. All in all, a fun night. We hashed out some things that can be improved in future races, but I think the first attempt was a success.